Amazingly, the Beautyrest brand has been around for over 100 years and has been a leader in the industry by using the latest technology. The Simmons Beautyrest Crib Mattress is made with safety, comfort and durability in mind. This mattress dual-sided capacity (a firm side for an infant and a multiple-layer comfortable foam side for toddlers) is a definite plus for conscientious, cost-concerned parents. This product also offers a fire-protective wrap and water-proof capability. To top it all off, it’s also CertiPUR-US and Greenguard Gold certified—in other words, it’s been tested for safety and healthiness for babies and toddlers. So, are you wondering if this mattress is right for your little one? Read on for our expert Simmons Beautyrest Crib mattress reviews. 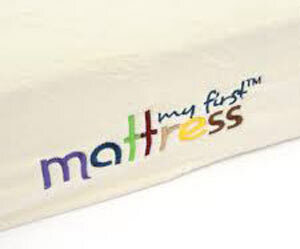 Want to explore more mattress for your child? Check out the 10 best crib mattress brands of 2019. The Simmons kids’ mattress is uniquely constructed to include a fire-protective wrap, a superlative woven cover, supportive comfort layers, unique corner protectors made from Innofoam, convoluted toddler’s side foam, “231 Luxury-Pocketed” coil springs, and 9-gauge all-around border wire. Simply put, the Beautyrest crib mattress is made with your own and your child’s best interests in mind by offering, in addition to those things already mentioned, a special reinforcement border protection, a no-harsh-chemical-involved naturally-based cotton fire-protectiveness wrap that meets/exceeds federal standards for flammability, a woven cover that is stain & water resistant, an environmentally-friendly design and a long-lasting warranty. Some people take comfort from mattresses that have flame-retardant chemicals in them. However, one has to ask whether the toxicity that some of the chemicals expose your children to is a good trade-off for potential fires. This mattress, though, offers some fire retardancy (with the use of natural cotton) without putting your child in harm’s way with such potential toxicity. Although the Simmons kids’ Beautyrest may have at one point been shipped in merely a heavy-duty plastic bag that used to get battered in transit, it’s now delivered in a more suitable box which protects the valuable cargo it carries. It’s also good to know that the mattress itself is also wrapped in a protective plastic wrap when it arrives. The Simmons Beautyrest Beginnings comes with helpful written instructions and tips. The Simmons kids’ Beautyrest crib and toddler mattress is Greenguard Gold certified, therefore assuring you that this product revealed in tests low levels of chemical emissions. So, this protects both your child and their sleeping environment from potentially dangerous chemicals. The Simmons baby mattress is also CertiPUR-US certified, assuring you that the foam in this mattress doesn’t contain dangerous lead, mercury, PBDE fire-retardancy chemicals, phthalates, formaldehyde and other nasty substances. With a weight of about 25.4 pounds (and measuring 27.5 by 6 by 52 inches), this mattress is heavier than many other crib mattresses, especially the ones made entirely from foam. Consequently, the mattress isn’t the type of thing you’ll want to move in and out of a crib or toddler bed just for the fun of it. For some people, it may therefore present transportability issues—keep this in mind if you have back problems, aren’t capable of lifting anything beyond a certain weight and don’t have anyone you can delegate such tasks to. One of the advantages of this mattress is that you can easily wipe it clean using mild soap and a clean cloth. In spite of being impervious to liquids and stain-resistant, though, you should strive to clean it regularly and promptly, after spills and accidents. The Simmons Beautyrest Beginnings crib mattress is wrapped all around with a natural material base fire-protective wrap also featuring a medical-grade, woven-fabric water-resistant barrier. This resistance to liquids (as well as its stain resistance) will come in handy during all those times when spills and staining will take place at inopportune times. Another piece of great news about the Beautyrest Beginnings crib mattress is the fact that it isn’t built using potentially-dangerous fire retardant chemicals (e.g., boric acid). Instead, this mattress uses natural cotton as a fire-retardancy tool. The 100 percent naturally-derived cotton fire-protective wrap is non-toxic and simply doesn’t rely on chemicals known to resist fires. This also eliminates the unpleasant smells that would otherwise be present and which are common in many other mattresses. Most importantly, it passes federal flammable materials susceptibility standards tests. Simmons are a responsible company that continues to make excellent products at affordable prices. Their mattresses are consistently safe, innovative, technologically sound, comparable to the best products out there and responsive to the ever-changing demands/needs of the public. In fact, rather than following others, this company often sets the standard among competitors. This company’s long history is, in fact, the reason so many parents/guardians trust them to deliver products that are not only safe and affordable but practical and consumer-responsive. Although a mattress protector/pad isn’t generally necessary, providing one may add to the product’s longevity since the acidic/caustic nature of things line urine can take their toll after a while even on stain-resistant materials. This mattress, however, has other high-durability qualities, including its heavy-duty design, tightly-knitted fabric and waterproof capacity. Although some people may object to its relative heaviness, such things can be a sign of strong and durable qualities. In spite of its weight, though, this mattress is suitably firm but comfortable for both infants and toddlers. It’s simply superior to many of its cheaper, less-well-built competitors. To top things off, it does come with a limited life-time warranty. The Simmons kids’ Beautyrest Beginnings is made using “231 Luxury Pocketed” coils that greatly enhance the mattress’ supportiveness. This is further enhanced with unique corner protectors made from Innofoam and borders reinforced all around for strength and stability. The coil distribution in this mattress adds to its firmness, supportiveness and its ability to properly manage weight distribution, which helps against sagging and potential sinking-into the mattress suffocation issues. Although the concept of mattress “feel” is strictly a subjective one, it can nevertheless be an important factor, especially as more and more people lean to one side or the other. In this regard, you may compare the feel of a crib mattress to what you’d feel if touching an adult bed cover, quilt or mattress’ uncovered surface (if you were to lie on it without sheets). This mattress’s bare surface isn’t necessarily plush or sofa-like-soft but it’s soft enough to lay a child on without sheets, even if that’s not the best case scenario. It must be reported that some people have reported seams coming apart, leading to tears in the mattress. Many other reviews, though, report the opposite: that the seams are tight and well-secured; the edges, furthermore, appear to be sewn against and rolled against the mattress’ fabric, thus reducing chances of threads hanging loose ready to be pulled by inquisitive fingers. Since the warranty is supposed to cover product construction deficiencies, if you were to encounter such a problem, the warranty should deal with a scenario of this nature. Bounciness tests can tell you many important things, including how suitably firm and soft a mattress ultimately is. Too much bounciness means there is too much firmness and if nothing bounces on it, then it’s probably too soft. This mattress, however, has just the right amount of bounce to it. 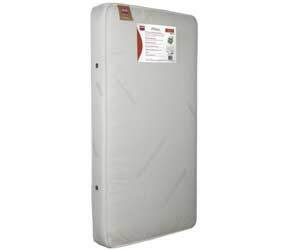 The Simmons Beautyrest kids’ mattress corner protectors made from Innofoam are nice features unique to this mattress. They add strength and stability and help to mitigate the potential problems common to mattresses with innersprings. Neither fully square nor round, the corners on this mattress don’t seem to interfere with how snugly these mattresses fit into cribs. First of all, the firmness offered by this mattress isn’t memory-foam like, not that it’s supposed to be. Some people have reported seeing indentations in the mattress where an infant lay for a while. Needless to say, this is not a good indication but it’s fair to ask if these reports are accurate/truthful and if they may simply be isolated incidents—for example, some people may exaggerate a problem or they have ended up with a defective mattress that isn’t representative of the entire product line. The preponderance of the reports, though, does not support these claims. It’s important that mattresses fit neatly and snugly inside a crib. If you notice a significant gap in the fit, then you may have a problem. Such gaps can be places where things can fall and hide, later to be found by inquisitive fingers; it can also be a place for bugs to hide; finally, it can be a place where limbs can get caught, potentially leading to injuries. In general, there shouldn’t be too wide a gap (more than an inch) between the edge of the mattress and the crib rails or toddler bed’s sides. This mattress, for the record, doesn’t seem to have this problem, as long as standard-sized cribs are being used. In spite of its impressive features, this mattress doesn’t come with an intimidatingly high price. In fact, it costs about half of what a good quality organic mattress would cost. Its dual-sidedness is definitely one of this mattress’s best qualities. It’s like getting too beds for the price of one: a firm side for the infant and a softer side for the toddler. This feature makes it possible to keep re-using the mattress over time, as well as making sure that it lasts longer as a whole. The dual-sided quality of this mattress makes it possible to give infants a firm side that reduces bounciness while at the same time providing the resistance infants need to develop strong, well-coordinated muscles and limbs. The metal coils, the reinforced borders and the corner protectors made from Innofoam add to the good support expected from high quality crib mattresses. If proper support is important to you, this mattress is a good choice, especially in view of the ever-present danger of SIDS. Another aspect that makes the SIDS danger more pressing is the possibility of infants getting stuck when rolling over—something less likely with this mattress. On the toddler’s side, which is made of foam, there’s a convoluted comforting layer. The mattress is made to actually give enough support and firmness to also be comfortable enough for the increasing need for comfort from toddlers-not every mattress can lay claim to that. The Simmons baby Beautyrest crib mattress has a 9-gauge wire border all around the mattress; this helps to support the corners, which in turn, keep the mattress from losing it shape or sagging. This is ideal for a 2-in-1 crib mattress. This design is one of the reasons this mattress has such excellent edge support; not only does it reduce chances of falling (if used on a toddler bed) but, also, chances of limbs getting caught between rails/walls and mattress edges. Unfortunately, this mattress doesn’t sport any temperature control capacity or features. Then again, the holes it has built into the sides should release otherwise-building-up warm air, thus letting cool air continuously seep in. You might consider a cooling mattress cover for additional heat controlling/mitigating capacity. Reportedly, this crib mattress doesn’t appear to retain heat, as might lower-quality, no-air-holes-on-the-sides mattresses. Apparently, the holes, though a rather simplistic way to fight heat retention, do what they are supposed to do. Mattresses that trap heat can be both uncomfortable (since they won’t help keep children cool) and dangerous—this mattress, however, doesn’t seem to have such a problem. Although this mattress isn’t pushed as a great-breathability product, it apparently has no issues to worry about. The holes on the sides appear to do their job. This mattress doesn’t appear to have any noticeable chemical smells, although it must be pointed out that no mattress is “smell free.” The thing to worry about, though, is a smell that originates from potentially toxic chemicals—none of which seem to be in this product. In this regard, this mattress may be even better than an organic one, which can have what are called “pure smells.” The pleasantly hypoallergenic superlative woven cover is the icing on the cake of a relatively safe mattress.